Rashed A. Al Ansari, General Manager or Al Ansari Exchange, told Emirates 24l7 that the company plans to increase branches from 170 to 220 and employee’s numbers from 2,500 to 3,000 in five years as the population of the UAE increases with the new projects coming online in Dubai and Abu Dhabi and demand for their services grows. Al Ansari believes that growing UAE population, development projects by the government and private sector – especially tourism – will fuel growth to all sectors not just currency exchange and remittances industries. “We always look at long-term... We try to secure better locations for the customers. Not necessarily that we’ll open all 50 branches in different locations; sometimes we add a branch next to existing one to support it because there’re long queues of customers and the single branch is not able to cope up with the rush. For example, we have two branches in Mall of the Emirates, Ibn Battuta Mall and Sahara Mall in Sharjah to enhance services so that the queuing time is less,” he added. There are 140 exchange houses registered in UAE with more than 1,000 branches housing over 13,000 employees. According to World Bank figures, Dh120 billion were remitted from the UAE last year with India (Dh46bn), Pakistan (Dh17bn), Philippines (Dh13bn), Bangladesh (Dh10bn) and Egypt (Dh7bn) making it to the top five remittance receiving countries from UAE residents. 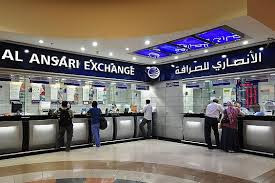 Remittances sent through Al Ansari Exchange totalled Dh40 billion in 2015, making up 35 per cent of the total remittances went out of the UAE last year. Al Ansari said remittance fees charged by the exchange houses from customers are among the lowest in the world. “I think the margins are already low and whatever price war or further fee reduction you may see will be temporary. Because if your margin is already low then further reduction in fee is called marketing to increase market share. And then you have to go back to market rate to be profitable. And the UAE has one of the lowest fees worldwide,” Al Ansari said, quoting World Bank report.